I often get annoyed when the regular available portion sizes are much too big of what one can use up or eat. For example, ice cream. My kids are still small. They would be happy with an apricot-sized scoop. Instead the smallest scoop size available is apple size. They never finish it, soon it starts dripping all over them and me. The big mess ends with us throwing at least half of it away. The other day, my husband came home from shopping with a prepacked bunch of fresh rosemary that looked like half a kilo. What on earth can you cook with that amount of rosemary before it dries up? I put it into almost everything: savory breads, onto grilled fish and chicken, potatoes. Everyday we had rosemary with something. But the bunch didn't seem to get any smaller. 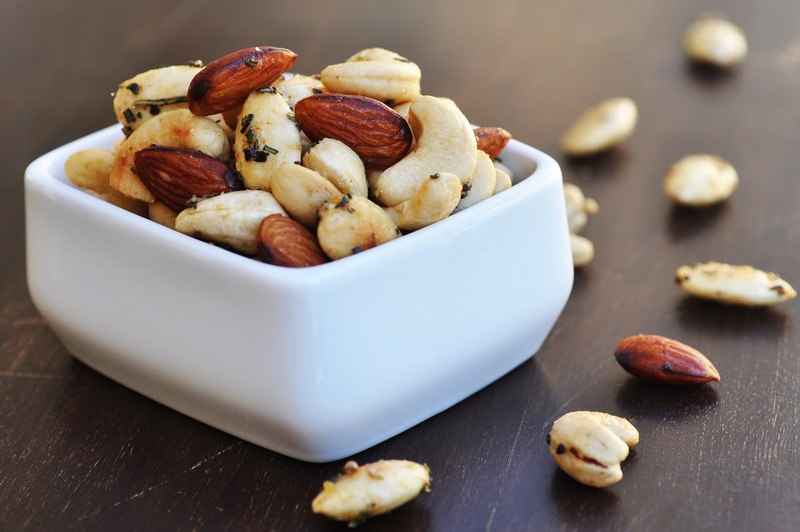 I went to search for more recipes that included rosemary, and found this little jewel: Rosemary Mixed Nuts. I am crazy about homemade spiced nuts. Never thought of putting in rosemary as the usual recipes just call for spices, not for herbs. The flavor combination is heavenly: savory from the salt, a little sweetness from the the nuts and the sugar, spiciness from the cayenne and earthiness from the rosemary. These are addictive.The perfect thing to impress with as an appetizer or party snack. I only made one batch of these nuts which didn't last long. However, the rosemary dried in the meantime and I had to throw it out. Shame, I hate doing that. But whenever I will have rosemary int he house again, a couple of tablespoons will be saved for these nuts. Spread the nuts in a single layer on a baking sheet. Toast for 8 minutes, until they become fragrant. Meanwhile, mix the rosemary with pepper, sugar, salt, and melted butter. Transfer the mix into a bowl that is big enough to hold the nuts. When the nuts are done, transfer them into the prepared bowl immediately and toss with the rosemary mixture while they are still hot. Let cool. Keep in airtight container.